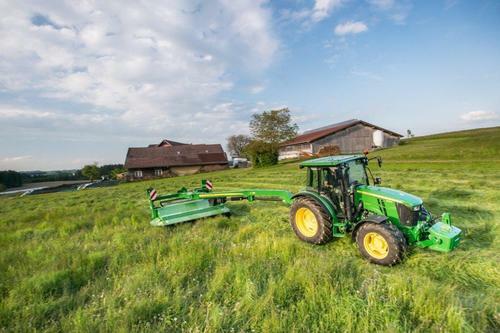 John Deere’s new 600 side-pull and 800 centre-pivot mower conditioners serve a wide range of customer needs from the small and medium sized livestock farm to large livestock farms and contractors. Since smaller livestock farms are often mowing less than 100ha a year, they are primarily interested in low operating costs. Medium size farms mowing between 100 and 400ha per season, as well as large farms and contractors mowing more than 400ha a year, put a higher emphasis on uptime and performance. John Deere’s new 630/635 and 830/835 mower conditioners have therefore been designed to meet all these requirements. They are available in working widths of 3m and 3.5m, with a choice of impellers or rollers for the conditioning process. Their reinforced frames, large tyres and redesigned transmissions are built to ensure long-term reliability and high performance. As an exclusive feature, the modular cutter bar of the 600 and 800 Series mower conditioners allows high-speed mowing in the field, and has been engineered to duplicate the load conditions of a self-propelled machine. The mowers’ balanced design and high ground clearance increase field performance, while the newly designed floating suspension system allows the machines to closely follow ground contours. The 600 and 800 Series conditioners are now equipped with preloaded tines, which significantly increase their capacity and the crop flow under varying harvesting conditions. Even in heavy and wet crops and at high working speeds, the parallelogram design of the conditioning hood maintains the optimum distance between the impeller tines and the hood at all times. Alternatively, adjustable rubber conditioning rollers are available. Additional features include a new generation swivel hitch for better coupling and decoupling, and improved disc protection to reduce the impact of foreign objects.